China, Korea, and Japan each have a long history of flying kites and from time to time each one will assert that they invented the kite, however the most likely inventor seems to be China. China had all the ingredients on hand, silk for sail and string, and bamboo for the frame. China also had a relatively more advanced culture than either Korea or Japan at a relatively earlier date. The Chinese claim the first kites were made by 2 philosophers in the 5th century BCE and were shaped like birds. Early kites were not made for fun, they usually had some military or scientific purpose. About 200 BCE Chinese General Han Hsin used a kite to help work out the distance his soldiers would have to tunnel to get past the defenses and into a city he was besieging. And in CE 549 there is a Chinese record of a kite being used to ask for a rescue mission to be sent out to aid troops in trouble. It appears that early kites were used for communications, signaling, and sometimes for military observations; there are accounts of kites being built large enough to carry a man, who could then spy on enemy troops. The first account of a kite from Korea comes from CE 637 during the first year of Queen Chindoks’ reign in the kingdom of Silla. Two armies were at war and a shooting star fell from the sky, demoralizing the Silla troops who saw it as bad luck. Silla General Kim Yu Sin attached a burning cotton ball (in some accounts burning straw) to a kite and had it fly up into the night sky. The troops saw this and believed that the shooting start returning into the sky equaled all their bad luck going away. Believing in their new luck the Silla troops won the battle. There is also an account of a 14th century General Choe Yong using kites for shooting firearms, but I couldn’t find out how exactly he did that. Perhaps the most well known use of kites in Korea might be by Admiral Yi Sun Sin, one of Korea’s most famous heroes. During the late 16th century invasions of Korea by Japan, Admiral Yi led his small navy to victory over the very much larger Japanese navy. There were multiple reasons for his victory, one of which was the use of kites to signal orders to his ships, allowing him to direct them during the battles at sea. It is thought that the first kites were made using silk as the ‘sail’ which made a kite expensive, and only something for the rich, or the military. After some time, however paper began to be used, which made them much cheaper and allowed more people to have access to them. The paper used most was hanji, a very strong Korean paper made from the inner bark of a mulberry tree. Even the Chinese would import Korean hanji paper because it was the best for multiple uses. It is a strong paper that doesn’t tear easily. Early kites in both China and Korean were rectangular. 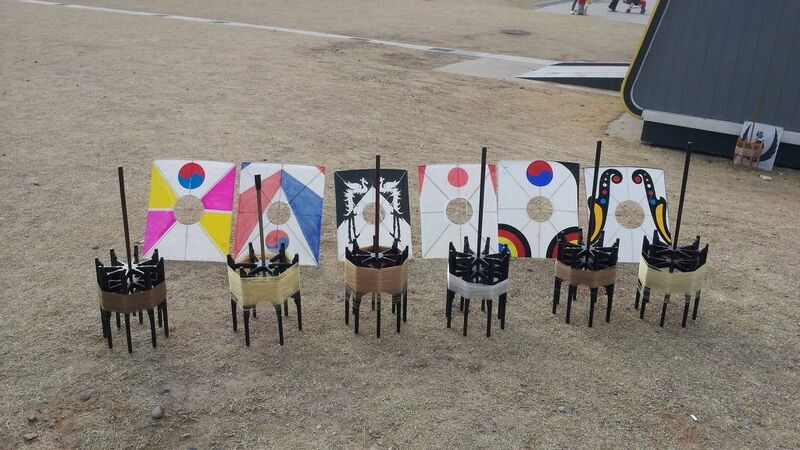 I couldn’t find when the hole in the middle of the traditional Korean kite became popular, but it helps increase stability, especially in strong winds, it also makes it more maneuverable in light winds. Nowadays a medium weight hanji called sunji is usually used by those wanting to make a traditional kite. 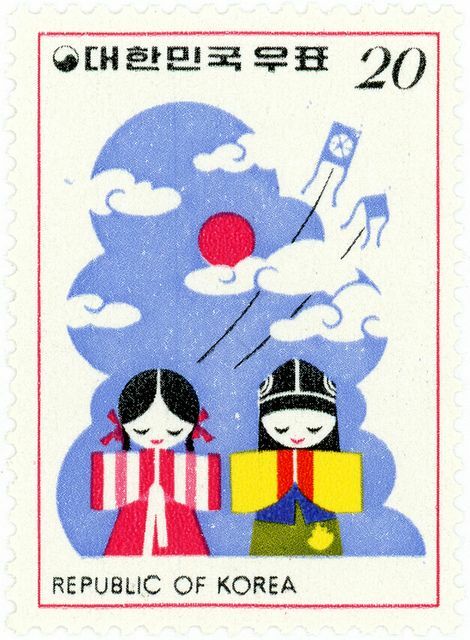 Korean kites can come in many shapes and sizes, but the 2 most common are the rectangular shield kite known as Bangpae Yeon with a hole in the middle, and a diamond shaped kite traditionally with 3 tails called a Gaori Yon. Animal shapes as well as other shaped kites can also be seen flying in the skies above Korea. In the 20th century a famous kite maker called No Yu Sang did much to stop the traditional pastime of kite flying from disappearing. He was the president of the Korean Folk Kite Preservation Society and was recognized as a Human Intangible Cultural Asset by the Korean Government.He said that the traditional Korean kite was”simple but capable of demonstrating wonderful feats in the air.” His grandson carries on this craft to this day and sees many of his kites being bought by overseas clients. Kite flying can still be seen in open spaces like the parks along the Han river in Seoul, and in the countryside and on beaches, but it is not the popular pastime it once was. It still seems to be a good thing to do on a date and it can be enjoyed by people of any age. Unbelievably it is actually quite good exercise and helps people get outside and into nature, thereby reducing stress. Part 2 will be about my attempt at making my own Korean kite. You may also enjoy Hanji: Korean Paper, Archery in Korea, Ssireum: Korean Style Wrestling, and Korea’s Greatest Hero. Photos were found on Pinterest and are credited to original owners. Please do not copy or use without permission and accreditation.